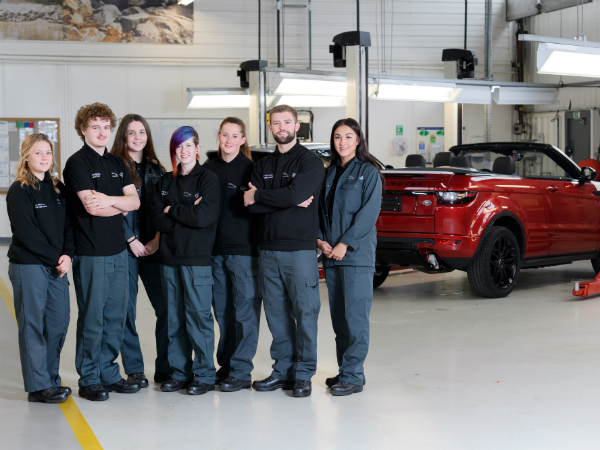 Jaguar Land Rover Halewood has welcomed seven new apprentices from across the North West to its award-winning Halewood factory - which manufactures Range Rover Evoque and Land Rover Discovery Sport - and for the first time in the factory’s history there are more successful female candidates than men. Five of this year’s intake who are about to start the 4 year-long Automotive Trailblazer Advanced Apprenticeship are women and at the end of the programme they will play a key role in helping to manufacture the next generation of Jaguar Land Rover vehicles to be produced on Merseyside. Aimee Cheung, Hannah Cocklin, Isabella Dickinson, Olivia Robinson and Natasha Winstanley (see pen profiles below) have all won their places after completing a series of challenging aptitude tests and interviews. After completing their apprenticeship they will specialise in Mechatronics and Toolmaking; designing, testing, installing and servicing the state-of-the-art machinery across Jaguar Land Rover’s 300 acre factory complex, supporting its 4,200 strong workforce. Technology-based careers in the automotive manufacturing sector don’t attract many female applicants, despite the fact they often excel in relevant subjects like design, engineering, mathematics and IT at school. In fact, only 9% of the UK’s engineering workforce is female. However, Jaguar Land Rover, the UK’s largest car manufacturer, runs a series of initiatives to address this including their Young Women in the Know programme. The programme inspires female students to visit Jaguar Land Rover factories including Halewood to gain an in-depth understanding of the extensive range of career opportunities available to them, take part in hands-on engineering activities and meet with the company’s female engineers. Since it was launched in 2012 Young Women in the Know, delivered by Jaguar Land Rover’s Education Centre team, has engaged with over 200 participants of whom 85 have secured apprenticeships helping the company to grow its female engineering workforce to 11%. This year we are reaping the rewards of our push to attract more female applicants into manufacturing. In 2012 just 14% of our apprentice intake were female, compared to 71% in 2017. Jaguar Land Rover is now looking to recruit more young people to join their 2018 apprentice programme. The window for applications is now open – please go to www.jaguarlandrovercareers.com for more information. There is no application deadline this year as the process will close once we achieve a specific number of applicants so young people are encouraged to apply early to avoid disappointment. The plant also held an open evening on Thursday 12 October for young people, their parents and teachers to explain what opportunities are available at the plant and how the application process works. This event was fully booked several weeks in advance.